So I had a few days before term 2 starts and was able to arrange a little tour to visit old friends in north-east Fife. 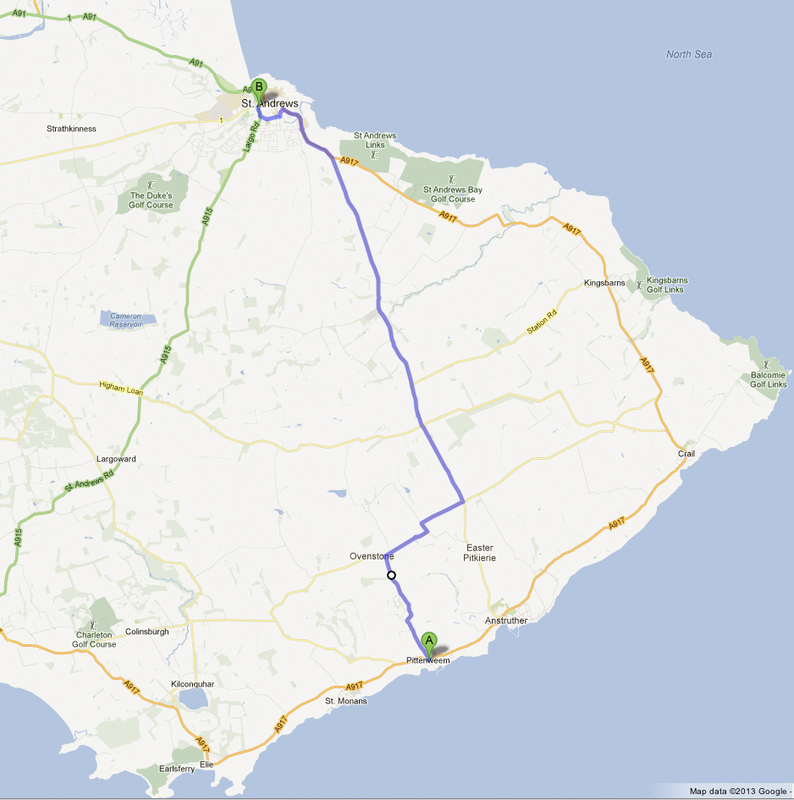 On Thursday I cycled from Edinburgh to Crail. Lev was carrying 2 full panniers – spare clothing and waterproofs, MacBook Air, various chargers, sandals, Marianne the cuddly pig, various unguents, etc – and so I wasn’t fast. A bumpy ramp on the Fife end of the Forth road bridge affected Lev’s recently reset brakes so that I was pushing against resistance for the next 30 miles. 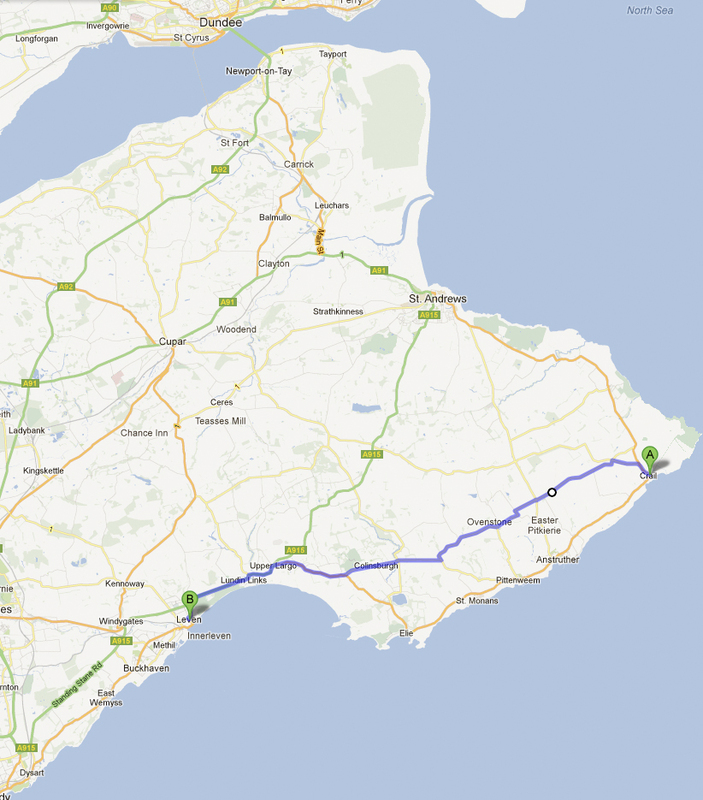 Here’s as much of the route as jPhone managed to map. Roll on getting that hub-dynamo and AC to USB-DC converter! There then followed a great evening at Crail folk club, followed by lots of catching up with an old friend and her new man! I promise not to leave it so long in future. On Friday I cycled into the wind and sleet to visit other friends in Pittenweem. The only hassles were a pothole in Anstruther, then needing to backtrack to the co-op to find a toilet. Here’s a couple of mug-shots. The penultimate cycle was Saturday’s fairly easy jaunt from Pittenweem to St Andrews, passing through Beleybridge (one of my many former abodes). I do miss some of the old times. After an all-to-short few hours with friends in the Whey Pat, it was time to head back to my beloved in Edinburgh. The cycle to Leuchars gave rise to this rant. Here’s to doing this again, with less luggage and more time seeing folk, in February or March!